Cream was a 1960s British rock band consisting of bassist/vocalist Jack Bruce, guitarist vocalist Eric Clapton, and drummer Ginger Baker. They were celebrated as the first great power trio and supergroup of rock. Featuring a hybrid of blues, pop, and psychedelic rock, Cream combined Clapton's virtuoso blues guitar playing with the voice and bass lines of Bruce and the jazz-influenced drumming of Ginger Baker to create a unique, hybrid style that became highly influential on the musicians of their generation. The band has sold over 35 million albums worldwide. Its Wheels of Fire LP was the world's first platinum-selling double album. Cream's music included songs based on traditional blues such as Robert Johnson's "Crossroads" and modern blues such as Albert King's "Born Under a Bad Sign," as well as psychedelic original songs like "Strange Brew" and "Tales of Brave Ulysses." Cream's biggest hits were "I Feel Free" (UK number 11), "Sunshine of Your Love" (U.S. number five), "White Room" (U.S. number six), and "Crossroads" (U.S., number 28). Together with The Jimi Hendrix Experience, Cream made a significant impact upon the popular music of the time, providing a powerful yet technically impressive musical style that foreshadowed the emergence of bands such as Led Zeppelin, Deep Purple, and The Jeff Beck Group. The band's live performances influenced progressive rock acts such as Rush, jam bands such as The Allman Brothers Band, Grateful Dead, and Phish, and heavy metal bands such as Black Sabbath. Cream was ranked number 16 on VH1's 100 Greatest Artists of Hard Rock. 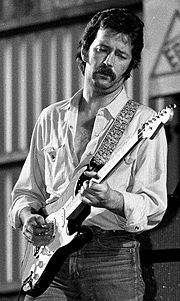 Eric Clapton June 19, 1977; best known for his work with Cream, Derek and the Dominoes, and a very successful solo career. By July 1966, Eric Clapton's career with The Yardbirds and John Mayall's Bluesbreakers had earned him a reputation as the premier blues guitarist in Britain. Clapton's virtuosity and raw power with the instrument famously inspired one fan to spray paint the words "Clapton is God" on the wall of an Islington underground station. Clapton, however, found the environment of Mayall's band confining, and sought to expand his playing in a new band. In 1966, Clapton met Baker, then the leader of the Graham Bond Organization, which at one point featured Jack Bruce on bass, harmonica, and piano. Baker, too, felt stifled in his band. Each was impressed with the other's playing abilities, prompting Baker to ask Clapton to join his new, then-unnamed group. Clapton immediately agreed, on the condition that Baker hire Jack Bruce as the group's bassist. Clapton had the biggest reputation of the three in England, but he was all but unknown in the United States, since he left The Yardbirds before "For Your Love" hit the American top ten. Cream made its unofficial debut at the Twisted Wheel Club in Manchester on July 29, 1966. Its official debut came two nights later at the Sixth Annual Windsor Jazz & Blues Festival. Being new and with few original songs to its credit, the group performed spirited reworkings of well known blues songs that thrilled the large crowd. Bruce served as the group's primary vocalist, while Clapton, still shy about singing, occasionally harmonized with Bruce and, in time, took lead vocals on notable Cream tunes, including "Four Until Late" and "Strange Brew" (1967); "Disraeli Gears" and "Badge" (1969); and "Goodbye" (1969). Cream's debut album, Fresh Cream, was recorded and released in 1966. The album reached number six on the UK charts and number 39 in the United States. It mainly consisted of blues covers, including "Four Until Late," "Rollin' and Tumblin'" (Muddy Waters), "Spoonful" (Howlin' Wolf), and "I'm So Glad," (Skip James). The rest of the album featured songs written (or co-written) by Jack Bruce, most notably "Wrapping Paper" and "I Feel Free," which became a UK hit single, and two songs written by Ginger Baker, including "Toad," which contained one of the earliest examples of a drum solo in rock music). Cream first visited the United States in March 1967, to play nine dates at the RKO Theater in New York. The band returned to record Disraeli Gears in New York between May 11 and May 15, 1967. Cream's second album was released in November 1967 and reached the Top Five in the charts on both sides of the Atlantic. Produced by Felix Pappalardi and engineer Tom Dowd, it was recorded at Atlantic Studios in New York. Disraeli Gears is considered the band's defining effort, successfully blending psychedelic British rock with American blues. Featuring "Strange Brew," "Tales of Brave Ulysses," and "Sunshine of Your Love," it was the first Cream album to consist primarily of original songs, with only three of the 11 tracks written by others outside the band. In late 1967, Cream incorporated more jamming time in their repertoire, some songs stretching out to 20 minutes in concerts, a tradition demanded by fans. Long drawn-out jams in songs like "Spoonful," "N.S.U.," and "Sweet Wine" became live favorites. Cream's third release, Wheels of Fire (1968) topped the American charts. Wheels of Fire showcased Cream moving slightly away from the blues and more towards a progressive rock style highlighted by odd time signatures and various orchestral instruments. However, the band did record a live blues favorite, "Sitting on Top of the World." The opening song, "White Room," became a popular radio staple. "Politician" was written by the band while waiting to perform live at the BBC. Another popular track off the record was a cover of Albert King's "Born Under a Bad Sign." The album's second disc featured three live recordings from California's Winterland Ballroom and one from the Fillmore. Eric Clapton's solo in "Crossroads" became famous and is often cited as one of the greatest live rock concert guitar solos ever recorded. The 16-minute "Spoonful," from their March Winterland show, became their most epic song and a concert favorite. Ginger Baker's solo in "Toad" is widely regarded as one of the greatest live drum solos in rock history. In mid-1968, Clapton was much impressed by Bob Dylan's former backing group, known as The Band, and their debut album, Music from Big Pink. He was also influenced by a scathing Cream review in Rolling Stone magazine, in which reviewer Jon Landau called him a master of "the blues cliché." It was in the wake of that article that Clapton wanted to end Cream and pursue a new musical direction. At the beginning of Cream's farewell tour on October 4, 1968, in Oakland, nearly the entire set consisted of songs from Wheels of Fire. From its creation, Cream was faced with fundamental problems that would later lead to its dissolution in November 1968. Rivalry between Bruce and Baker created tensions in the band, and Clapton felt that the members of the band did not listen to each other enough. Clapton later related that once when Cream was playing in a concert, he stopped playing, and neither Baker nor Bruce noticed. Cream made the decision to split up in May of 1968, during a tour of the U.S. In July, an official announcement was made that the band would break up after a farewell tour of the United States and after playing two concerts in London. Cream's "farewell tour" consisted of 22 shows at 19 venues in the United States between October 4 and November 4, 1968, and two final farewell concerts at the Royal Albert Hall on November 26, 1968. Initially another double album was planned, comprising live material from this tour plus new studio tracks, but a single album, Goodbye was released instead with three live tracks taken from their performance at The Forum in Los Angeles on October 19, 1968, and three studio tracks, one written by each of the band members. The final United States gig was at the Rhode Island Auditorium, November 4, 1968. Goodbye was released in early 1969, after the band had broken up. Its most notable cut was, "Badge," written by Clapton and George Harrison, who also played rhythm guitar. In 1993, Cream was inducted into the Rock and Roll Hall of Fame performing its first concert together since its farewell tour at the induction ceremony. Initially, the trio was wary about performing, until encouraging words from Robbie Robertson of The Band inspired them to try. The end result was a powerful set consisting of "Sunshine of Your Love," "Crossroads," and "Born Under a Bad Sign." Clapton stated in his acceptance speech that their rehearsal the day before the ceremony had marked the first time they had played together in 25 years. The performance spurred rumors of a reunion tour. Bruce and Baker went so far as to say in later interviews that they were, indeed, interested in touring as Cream. A formal reunion did not take place immediately, however, and Clapton continued to pursue solo projects, as did Bruce and Baker, although the two did work together again in the mid-1990s as two-thirds of a power trio, BBM, with Gary Moore. In 2004, it was officially announced that Cream would finally reunite for a series of four shows, on May 2-6, 2005, at the Royal Albert Hall in London, the venue of their final concerts in 1968. Even more surprising was that the reunion came at Clapton's request: Although the three musicians chose not to speak publicly about the shows, Clapton would later state that he had become more "generous" in regard to his past, and that the physical health of Bruce and Baker was a major factor: Bruce had recently undergone a liver transplant for liver cancer, and had almost lost his life, while Baker had severe arthritis. Tickets for all four shows sold out in under an hour. Touts were soon charging outrageous prices for what became one of the hardest-to-get tickets in rock-and-roll history. The performances were recorded for a live CD and DVD. Among those in attendance were Paul McCartney and Ringo Starr, Steve Winwood, Roger Waters, Brian May of Queen, Jimmy Page of Led Zeppelin, and also Mick Taylor and Bill Wyman, formerly of the Rolling Stones. The reunion marked the first time the band had played "Badge" and "Pressed Rat and Warthog" live. The Royal Albert Hall reunion proved a success on both a personal and financial level, inspiring the reformed band to bring their reunion to the United States. For reasons unknown, Cream chose to play at only one venue, Madison Square Garden in New York City, from October 24-26, 2005. The shows were marred by some controversy in regard to tickets: The show's promoters had made a deal with credit-card company American Express to make tickets available to American Express customers only in a week-long pre-sale. The plan was flawed and ticket scalpers amassed quantities of the tickets and which they re-sold at exorbitantly high prices. Despite this the shows were a financial success and received critical praise. It would be quite a challenge to try to create music that would stand up to the classic songs. I've got a few ideas already—in fact, I wrote a song yesterday that I think would work. I just don't know if it will happen, because we all feel the band is so special we don't want to do it that often, if we go on. We've had offers you wouldn't believe—I didn't believe—for long world tours, and it's tempting. But none of us wants to accept because it would take away from the rarity and special nature of getting together. I'd like to do it every now and again and just play somewhere, but we could do an album amidst that, and I'm going to suggest it. In 1969, Clapton and Baker joined Steve Winwood and Ric Grech in Blind Faith following an attempt by Clapton to recruit Steve Winwood into the Cream in the hope that he would help act as a buffer between Bruce and Baker. However, Cream broke up before Winwood had the chance to consider the offer. Inspired by more song-based acts, particularly The Band, Clapton went on to perform much different, less improvisational material with Delaney & Bonnie, Derek and the Dominos, and in his own long and varied solo career. Jack Bruce began a varied and successful solo career with the 1969 release of Songs for a Tailor. Ginger Baker formed a jazz-fusion ensemble out of the ashes of Blind Faith, Ginger Baker's Air Force, which featured Winwood, Blind Faith bassist Rick Grech, Graham Bond on sax, and Denny Laine of the Moody Blues, among others. In February 2006, Cream received a Grammy Lifetime Achievement Award in recognition of their contribution to, and influence upon, modern music. That same month, a "Classic Albums" DVD was released detailing the story behind the creation and recording of Disraeli Gears. Farewell Concert—VHS, DVD, recorded Royal Albert Hall, November 1968. Strange Brew—largely a re-edit of Farewell Concert plus some outtakes. Fresh Live Cream—VHS, DVD, documentary filmed just after the Rock & Roll Hall Of Fame reunion in 1993 containing band interviews and previously unreleased material. Royal Albert Hall London May 2-3-5-6 2005—DVD, recorded Royal Albert Hall, May 2005. Cream: Disraeli Gears (2006)—DVD, a reflection on what went into making Disraeli Gears, and the impact it had on the 60s. Cream: Classic Artists—DVD + CD, recorded before and after the Madison Square Garden reunion concerts; features interviews with band members, along with an audio CD containing five previously unreleased tracks from Swedish radio. Platt, John A. Disraeli Gears: Cream. New York: Schirmer Books, 1998. ISBN 978-0825671760. Thompson, Dave. Cream: The World's First Supergroup. London: Virgin, 2005. ISBN 978-1852272869. Welch, Chris. Cream: The Legendary Sixties Supergroup: Ginger Baker, Jack Bruce, Eric Clapton. London: Balafon, 2000. ISBN 978-0879306243. This page was last modified on 8 December 2017, at 16:32.